Data science is one of the fastest growing fields of our time. The only way you and your team can stay on top of the game is to always be open to learning and keeping up with the advances. Data conferences are a big way to stay up to date and in the know. Luckily, there are quite a few lined up in 2019! While the tickets can be expensive, the knowledge learned and networking opportunities are worth the hassle. Always make sure the conference is a correct fit for your interests and keep an eye out for special deals. Almost every conference has discounts available in some way. PyData is a space for data analysis tool developers to discuss and share new ideas and problems about data science and analytics. The conference is centered on open source Python packages but includes approaches to data analysis and visualization in other languages like R and Julia. Tutorials for novices and advanced workshops will be made available. The conference will be in Miami on Jan. 9-11, 2019. Check the website for registrations. The Third Annual Global AI Conference will focus largely on data created by various platforms and how AI can be used effectively with the information. This is the largest vendor-agnostic conference for AI. There will be discussions about all industries, including but not limited to health care, education, manufacturing, agriculture, and transportation. The conference will be held in Santa Clara, California, on January 23-25, 2019. The tickets range in price from a keynote and exhibits pass for $289 to an instant sponsorship pass for $4,000. World of Watson, Connect, Edge, Amplify and other IBM conferences are combined into the mega-event IBM Think. The conference will cover a variety of topics, including AI, big data and the Internet of Things, or IoT. The event will be held in Las Vegas on February 12-15, 2019. A full pass is priced at $1,995. The Gartner summit has a strong focus on data management, business intelligence and analytics with interests in AI, blockchain, and IoT. The summit’s purpose is to work toward a data-driven culture for better business practices around the world. Those attending the event will be data leaders, analysts, and solution providers. Data Science Salon focuses primarily on machine learning and artificial intelligence, or AI. People from varying fields, from media to finance to health care, are encouraged to attend. This is a conference for professionals to learn from each other and trade best practices, as well as provide networking opportunities, discuss problems and innovate new ideas. The conference will be in Austin, Texas, on Feb. 20, 2019. Though it’s only one day, the prices can’t be beat. Tickets are $225 per person and $125 for students. The main purpose of Domino Data Science is to discuss financial and insurance services in data science. Experts and professionals are encouraged to attend and share ideas, network and discuss problems. There will be a number of talks and workshops available. The event is being held in Boston on Feb. 27, 2019. Check the website for registrations. Reinforce, sponsored by Ericcson, brings together data science and machine learning experts to discuss the applications and future of Artificial Intelligence and Deep Learning. They also include full-day workshops on various AI topics. The event is being held in Budapest, Hungary on March 21-22, 2019. Check the website for registrations. Dataworks Summit will have a focus on data science, analytics, AI and how companies are using them for delivery and value. The summit will feature talks from data and business experts, as well as opportunities for meet and greets. Training sessions will also be available for attendees. This summit will be held in Washington, D.C., May 20-23, 2019. Tickets are $1,400. Dataworks Summit will also host another conference in Barcelona, Spain, from March 18-21. 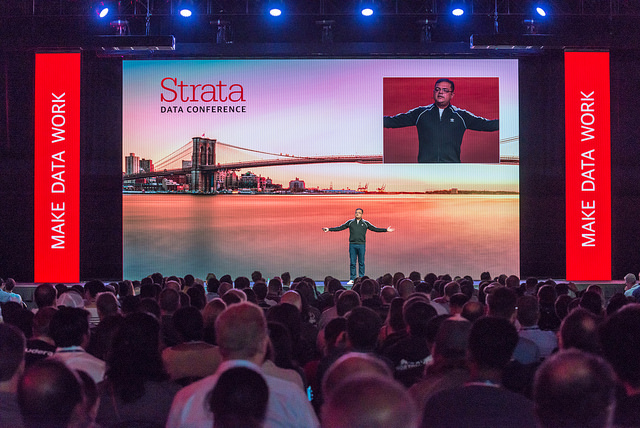 In collaboration with O’Reilly and Cloudera, the Strata Data Conference focuses on new technologies and methods for big data. Professionals, analysts, and data scientists are encouraged to attend, while the doors are open to everyone interested in the field of data science. The conference will be in San Francisco from March 25-28, 2019. 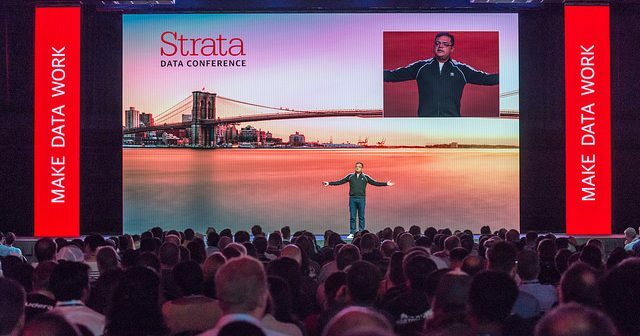 Strata will have another conference in London from April 29 to May 2. Formerly DataEngConf, this two-day community-driven event caters to software engineers, data scientists, CTOs, AI & ML researchers and founders. Topics covered include infrastructure, engineering, science, machine intelligence, analytics, AI product development, and the challenges faced in building data-oriented teams. Their partners include Airbnb, Spotify and Netflix. The conference will be held in San Francisco on April 17-18, 2019. Early bird tickets are priced at $799 and a regular ticket is $949. The Data Science Conference covers education for data science and oversource versus proprietary services. Data scientists, analysts, and machine learners are encouraged to attend, but the conference is dedicated to business analytics professionals. Those working in big data, data mining, AI, predictive modeling and machine learning may also find the conference beneficial. The conference will be in Boston on May 23-24, 2019. A single ticket is $1,250, but there are discounts depending on how many you buy. Predictive Analytics World has a focus on analytics in large datasets. Experts to beginners in data are encouraged to attend. Topics include relationship management, banking, insurance, financial services, government, and healthcare. The conference will be held in Las Vegas on June 16-20, 2019. Tickets range in price from a social network one-day pass for $150 to the mega five-day pass for $4,750. The 15th International Conference on Machine Learning and Data Mining brings together ML and data mining researchers to discuss latest research in specific areas: multimedia related applications, biomedical applications, and webmining. The 8th International Conference on Data Science, Technology and Applications (DATA) brings together researchers and engineers working on big data, data management, security and other advanced data applications. The conference will be held in Prague, Czech Republic on June 26-28, 2019. Ticket prices are broadly in the range of 535€ to 595€. The Fifth International Conference on Machine Learning, Optimization, and Data Science will be held in Tuscany, Italy, and includes talks, tutorials and presentations that promote research and exchange of innovative experiences and developments. The conference will be held in Tuscany, Italy on September 10-13, 2019. This week-long conference focuses on computer vision research and applications. They are currently accepting submissions and tutorials. The conference will be held from October 27 to November 2, 2019 in Seoul, Korea. The AI & Big Data Expo showcases next-gen strategies and technologies that businesses could benefit from. Participants include decision makers, heads of innovation, data scientists, developers, startups, VCs and more. Their main themes include Enterprise AI & Digital Transformation, Data Analytics for AI & IoT, Big Data Strategies, AI and the Consumer, Developing AI Technologies and Big Data for Industry. The conference will take on November 13-14th, 2019 at the Santa Clara Convention Center, Silicon Valley. No matter where you are, there will be a data conference near you eventually. Keep an eye out for new events around the world. When you find something you’re interested in, try to register as soon as possible because some events offer early-bird specials on tickets. Even an extra 10 percent off the ticket price can make a big difference. Most of all, go in with an open mind and have fun. Think we missed out something? Leave a comment and we’ll include your conference in the list. Looking to work with a freelance data scientist? Hire a qualified expert on Kolabtree. North Star AI is international technology conference focusing on the technical aspects of data science and machine learning. Two parallel sessions will cover data platforms, algorithms, tools and models, and discuss solving the hardest problems that exist within organising and analysing massive noisy data sets. Featuring 20+ AI experts/ speakers; 500+ developers, tech leaders, data scientists, analysts and product people; full day of 2 parallel sessions, followed by AI-themed party and AI Startup Competition. The main goal of North Star AI is to connect the best developers, engineers, data scientists and data-driven startup leaders. Attendees will hear innovative case studies and actionable insights, build career-enhancing skills and expand business network. Today, the combination of endless new data sources, cheap computing and new AI techniques is powering fundamental change – it’s time to ‘raise the bar’ in terms of technology. Artificial Intelligence and Data Science in Trading is the event for senior management from hedge funds and investment banks to discover how to maximize this opportunity. During this two day event you will learn from 95 world-class speakers from leading asset management companies, academia and technology providers. Technology is a critical competitive differentiator and attending AI & Data Science in Trading will allow you to benchmark your business and create a winning strategy. This is the largest focused meeting of experts within Capital Markets using AI for alpha discovery, managing risk and optimising portfolios, and takes place annually in both New York and London.